How much do I love New Orleans? Enough that going twice last year only made me want to go again this year. Twice. In the summer. The first time was in June for a conference. The second was a couple of weeks ago. Third week in July is absolutely as late as I was willing to go and flirt with hurricane season. Turned out to be absolutely correct in that I had the trade off of Hot as Blazes and summer season hotel rates, but I only got really caught in the rain once. But now the city is flooded again. The idea was to go places that I don’t normally go. I stayed at the Pontchartrain Hotel in the Garden District. Right on the streetcar line. Lovely staff, reasonable rooms. Two first world complaints: They use old school keys and if you lose yours, the fee is $250. And there are no ice machines so you have to call down to have it delivered. Oh, and the mini-fridge is of the mini-bar variety so it really isn’t usable. I was at the corner convenience store at least twice a day. After breakfast one morning (doughnut at District Donuts) I walked over to the Lafayette Cemetery. At the main entrance, a man sat in a lawn chair with a cooler filled with bottled water. Selling them for a dollar each. Excellent. Now, I had heard of Save Our Cemeteries, so I figured this was cool, but still wondered: Where, exactly, are the remains? A few minutes later, I saw an older man, rather sunburned but quite cheerful. He asked if I was looking for anyone in particular. Apparently, he knew where everyone was buried. I said I wasn’t, but asked if he could tell me about the cat. “Want to see?” He asked. He opened the door and I saw several Rubbermaid containers, like the ones my mother uses to store Christmas ornaments, on the bottom “shelf”. He explained that because of the heat and humidity, the remains (including the caskets) decompose very quickly. If I looked up on the top shelf, I could see some actual bones. I stood on my tip-toes and looked. “You’re going to have to get closer,” he said. We talked some more..about Lafayette (I was pretty sure he had no idea what he was talking about) and Confederates and restoring tombs. And he told me that you can only visit the cemeteries by the French Quarter if you are with a tour group. I certainly hadn’t needed a tour group when last I visited..but that was pre-Katrina. Well. It took me 2.4 seconds to decide this was probably a con. But Dude gave me an official vacation story and if he was misrepresenting himself as part of a charity, that was on his conscience. So I handed him some cash and moved on. Later (like five minutes ago when I checked to make sure it was the LaFayette Cemetery that I visited) I saw that empty tomb. It was always empty! Dude was full of it. It’s been over a month since I returned from Scotland and have discovered that I am past the point of being able to blog the pictures effectively. So here are the highlights. I am a single woman and I like to travel. Nothing too exotic so far, just the usual places on everyone’s bucket list. Because the world is big and I only have so much vacation time (and there are several places I return to again and again), the decision factors are Cost and Safety. Tour groups are great for safety if you are going someplace for the first time, but the “single supplement” often makes it cost prohibitive. The hospitality industry has made great strides in catering to singletons, but it is still easier to manage travel in pairs. In fact, there are a couple of tour groups that were created to solve this problem – they manage guided tours for women and will hook you up with a traveling partner. I still might do that someday. Can a single woman go to the Caribbean for Spring Break and feel safe without spending a fortune? There was a really good discussion thread that concluded..not really. I lamented that she is on a school district schedule, or I’d invite her to winter vacation with me. But late February is as long as I can wait before getting cabin fever in Chicago. This past Spring, I decided to plan a trip to Europe and I immediately thought of K. We went to high school together, and I can’t say we were particularly tight; “inside school friends” as opposed to “neighborhood friends”. But I’ve always liked her and she has the same problem I have and she lives in the next town over and why in hell haven’t I seen her in 20 years? So I sent her a message with my thinking and asked if she wanted to have coffee and talk it over. She agreed and we met on a Sunday at the coffee shop in our hometown. We didn’t shut up for three hours. Then we traded messages about places we thought we’d want to go and found plenty of common ground. We found flights and hotels and sketched out an itinerary. We’re going to do this. When you walk up to that ledge, and look down, you can see a great big, flat surface of lava rock. And depending on the weather, there are hikers down there. The first time I saw it, I went right back to the car to look at the map and try to figure out how to drive down. I couldn’t figure it out. It took two more trips (there’s other stuff to see!) before I realized that the only way down there is to hike it – the Kilauea Iki Trail. And of course, if you hike down there, you have to hike all the way back up. This year, I looked at the map and read the stats: four miles and 400 feet – which doesn’t sound bad at all. The catch was “moderate to challenging”. The estimated time to hike the loop is two to three hours. I had one bottle of water and one package of trail mix. It was 10am, the sun was shining and I had stopped to pee a half hour before. Voice 1: It’s not too late to turn back. Voice 1: You’re old, you’re fat, you’re out of shape. You think one yoga class a week makes you a hiker? Voice 1: You’re going to pass out! In public! Voice 2: It wouldn’t be the first time! Wouldn’t even be the first time in a National Park! Strictly speaking, that second part isn’t true, either. But you get the idea. And then, I was at the bottom of the lava lake. The trail is not difficult to follow, once you figure out which “stacked rocks” you are supposed to follow. And once you’re at the bottom, there is nothing to do but keep going. I did see a couple of fools hiking around in flip-flops, though. And you know what? The climb back up was not a problem. I turned back for a last look before leaving the rock and getting back on the dirt trail, and I realized that I’d already been climbing. I was all, “That must have been 100 feet! Only 300 more!” It was probably less than half that, but whatever. The steepest part of the climb was more of a natural ramp than stairs, so I picked the right direction for my loop. This was easily in the Top 10 Best Things I Have Ever Done on Vacation. For 1.4 seconds, I considered taking a selfie. I’m totally doing it again next year. Outside, by the pool were a couple spending the weekend for their anniversary. Apparently, they had gotten married at Cedar Grove several years ago and they told us all about the place. Scott was talking to the husband and the wife asked where we were from. When I said, “Chicago” she asked how we came to stay here. “Online,” I replied. 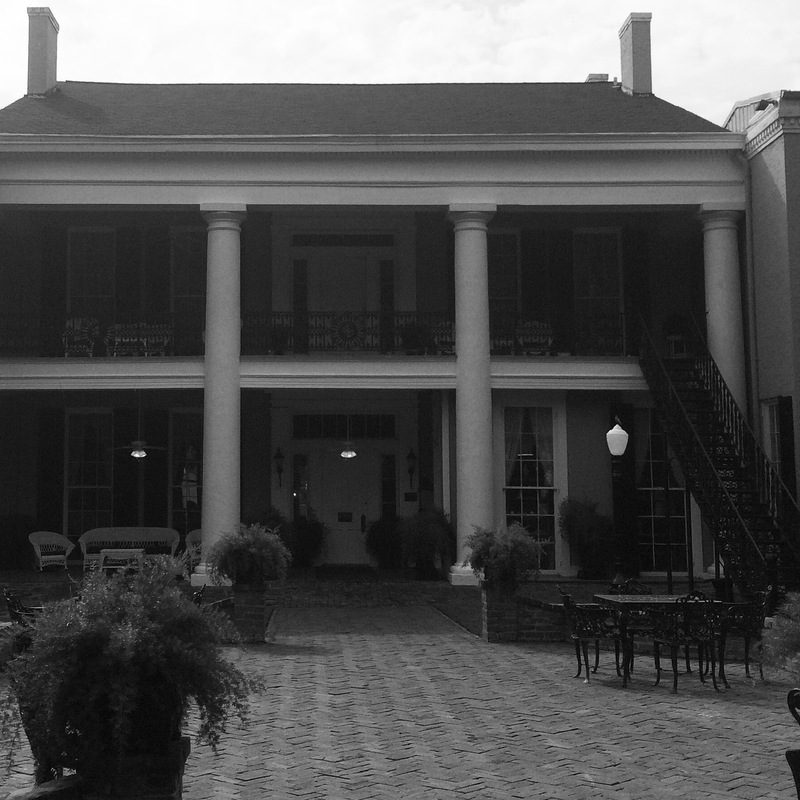 “I was looking for hotels in Vicksburg and Tripadvisor had a pretty convincing review that said the place is haunted. We’re staying in the Library Suite.” She did a double take and said she didn’t know anything about that. As we were walking away, I recounted the conversation to Scott. They got married here and couldn’t speak to the ghost stories? How very horror movie. We had dinner at the hotel restaurant that night. The food was decent, but pricey. The service was terrible. 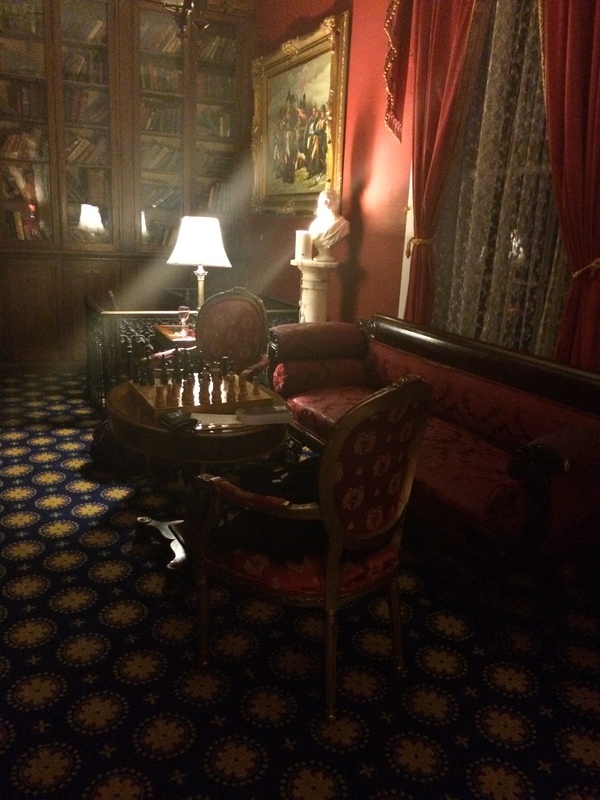 Then we went back to the room to take more pictures and see about the ghosts. See the diagonal shaft of light? That’s what I’m talking about. It was dark outside. The lamps were not pointed in that direction and to the left of the picture are the door to the room – then closed – and the dark fireplace. The reflections in the glass bookcase don’t explain it, so I am at a loss. We had heard that “manhandling” the books was the fastest way to make the ghostly gentleman of the house angry, so we decided against it on Night 1. I took a shower in that ancient tub and managed to soak the entire bathroom. Also, the drain was painfully slow which bothered me a lot. By the time I was ready to climb into the bed, my brother was watching Sharknado 2 on the television. So much for ghost stories. Road trip 2014 started with..I blocked a week from my work calendar for a vacation and then didn’t plan anything. By the time I got serious, the ticket prices had skyrocketed. At the same time, I had decided that I have not had enough summer and I wanted to be someplace where I was absolutely certain the weather would be balmy. I was looking at New Orleans when my mother – who can’t stand the idea of my being in New Orleans by myself even though I have been there plenty of times before – reminded me that Vicksburg, Mississippi has been on my road trip bucket list for awhile. Why, yes. It had. It’s a History Nerd thing. Don’t judge. So I started looking for hotels. I came up empty with my usual suspects – chain hotels where I have points or status or something useful to keep the cost down. Then I went to the website for the Vicksburg Convention and Visitor’s Bureau and found they have a whole lot of Bed and Breakfast places where the prices were quite reasonable. Because, you know. Who wants to be in Mississippi in August? So that is how I found Cedar Grove Inn. It was once one of those old antebellum mansions in town that became and B&B and has since built out to have 33 rooms, a bar, a restaurant and a swimming pool. It looked like a lovely place to sit outside and read books. So I clicked over to Trip Advisor to read the reviews, and the first one I found was a guest that had experienced a haunting. You might want to take a minute and read this. Filtered picture I posted to Instagram when we arrived. Short version: the Library Suite is a two-story room. The library is on top and the ghostly gentleman of the house seems to hang out there. The bedroom is down a spiral staircase in what had been a wine cellar…and later, during the siege of 1863, a morgue. The dead soldiers were kept there because it was cooler. Damn straight I wanted to stay there. But I wasn’t sure that I wanted to stay in the Library Suite by myself. So I started asking everyone at work. Stay at the hotel, they said, but not in that room. Yeah. That wasn’t the only room that was haunted. It just sounded the scariest. It took a little bit of schedule juggling, but I booked the Library Suite the next day. And I just realized that I don’t remember where I saw this fountain. I want to say it was behind the Natural History Museum, but it might have been behind one of the buildings in the National Gallery. 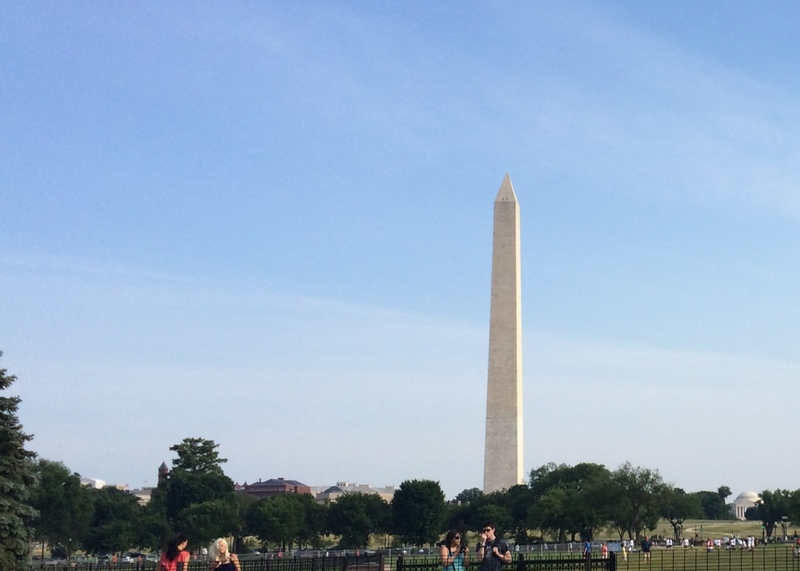 Because my office is on the..Jefferson Memorial side of the Mall, that is generally the way that I walk. But the other night, I walked over to the White House instead and was on Constitution Avenue rather than Independence. 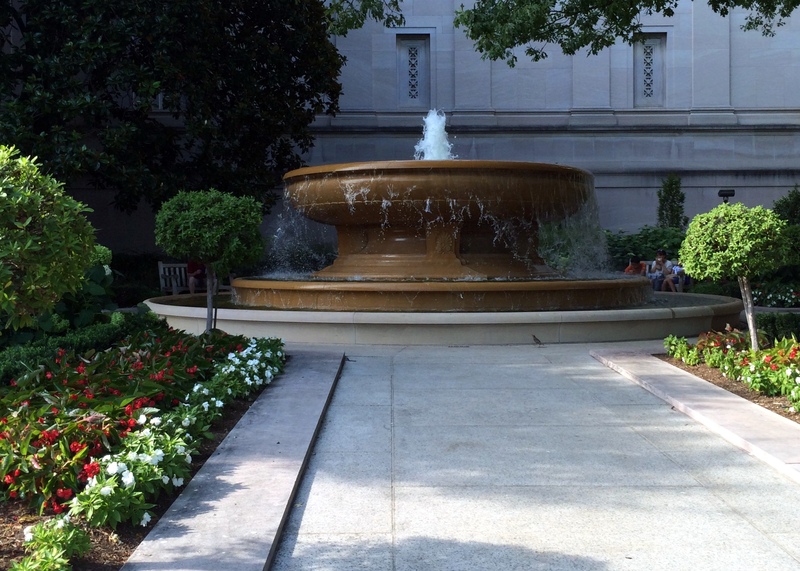 I found myself looking at the street entrances of the museums, rather than those facing the Mall. And there was the fountain. 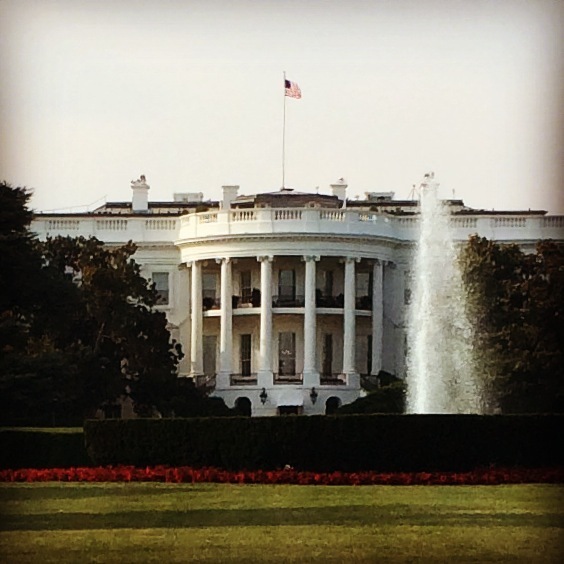 And here is the (Instagram filtered) obligatory pic of the White House. Note to my mom: I didn’t take a pic, and I had seen the statue before, but I just realized that General Sherman and his horse are looking right at the Treasury Building. I’m not sure that’s where I would have placed him. And then I went to the District Chophouse for dinner. According to Foursquare, I hadn’t been there in over a year. But I really appreciated that burger.